The rival Koreas have agreed to form their first unified Olympic team and have their athletes parade together for the first time in 11 years during the opening ceremony of next month's Winter Olympics in South Korea, officials say. The rival Koreas agreed Wednesday to form their first unified Olympic team and have their athletes parade together for the first time in 11 years during the opening ceremony of next month's Winter Olympics in South Korea, officials said. The agreements still require approval from the International Olympic Committee (IOC). 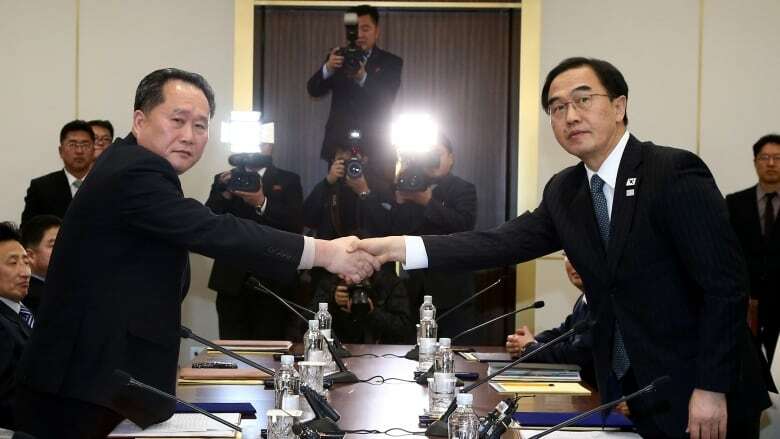 But they are the most prominent steps toward rapprochement achieved by the Koreas since they recently began exploring cooperation during the Olympics, following a year of heightened tension over the North's nuclear weapons program. During their third day of talks at the border in about a week, senior officials reached a package of agreements, including fielding a joint women's ice hockey team and marching together under a "unification flag" depicting their peninsula during the opening ceremony, Seoul's Unification Ministry said. 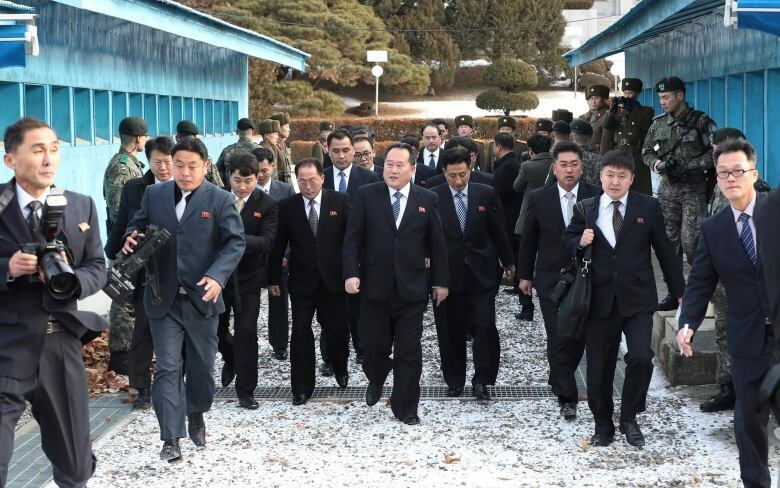 A joint statement distributed by the ministry said the North Korean Olympic delegation will travel to South Korea across their heavily fortified land border. It said the delegation will include a 230-member cheering group, a 30-member taekwondo demonstration team, and journalists, athletes and officials. Who is North Korea sending to the Olympics? Ahead of the Pyeongchang Olympics, the Koreas will hold a joint cultural event at the North's scenic Diamond Mountain and have non-Olympic skiers train together at the North's Masik ski resort, according to the statement. It said the North also plans to send a 150-strong delegation to the Paralympics in March. The agreements are highly symbolic and emotional. But it's still not clear how many North Korean athletes will be in Pyeongchang because none are currently qualified. South Korean media have predicted only up to 10 North Korean athletes will end up being covered by an additional quota from the IOC. A pair of North Korean figure skaters qualified for this year's Olympics, but North Korea missed a deadline to confirm their participation. The IOC said recently it has "kept the door open" for North Korea to take part in the Games. IOC officials are to meet with sports and government officials from the two Koreas and officials from the Pyeongchang organizing committee in Switzerland on Saturday. The IOC said in statement Wednesday that it has "taken note of a number of interesting proposals from different sources." "There are many considerations with regard to the impact of these proposals on the other participating NOCs [national Olympic committees] and athletes. After having taken all this into consideration, the IOC will take its final decisions on Saturday in Lausanne," it said. The two Koreas have previously sent joint teams to major international sports events twice, both in 1991. One event was the world table tennis championships in Chiba, Japan, and the other was soccer's World Youth Championship in Portugal. During an era of detente in the 2000s, their athletes marched together during the opening and closing ceremonies of nine international sporting events, including the Olympics and Asian Games, but they failed to produce a joint team. The current reconciliation mood began after North Korean leader Kim Jong-un said in a New Year Day's speech that he was willing to send a delegation to the Games. Critics have said Kim's overture is an attempt to use improved ties with South Korea to weaken U.S.-led international sanctions on North Korea while buying time to perfect his nuclear weapons program. The moves nevertheless have provided a temporary thaw in the Koreas' long-strained ties and fostered optimism that North Korea won't launch any new provocations, at least during the Olympics. Some conservative critics say North Korea's cheering and artistic groups are too big, and worry the North may try to steal the show at the Olympics to launch what they call a "peace offensive." North Korea also sent highly trained female cheering groups dressed in bright, attractive outfits when it attended previous international sports events in South Korea. The groups, chosen for their cheering skills as well as their good looks and dubbed "beauty squads" by South Korean media, often received more attention than their athletes. Kim Jong-un's wife, Ri Sol Ju, was a member of a 2005 squad. North Korea under Kim has made sports, and especially success in international sporting events, a high priority. While it's not a major winter sports competitor, North Korean athletes have set several weightlifting world records and its women hold a high profile on the world football scene. When travelling abroad, however, North Korean athletes and coaches tend to cloister themselves away from outsiders when they are not competing or practicing. Defections are likely a concern, along with what their minders might deem to be ideological "contamination," so they are kept under close scrutiny.